Two potholders in, and I already have more sewing supplies than I can comfortably carry around in my hand. 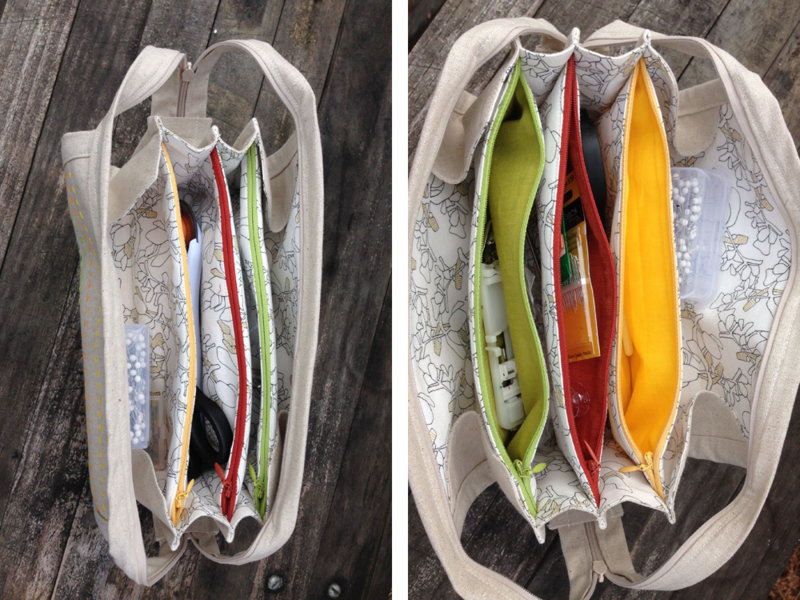 The Sew Together Bag, which I was able to put together in a weekend with relatively little sewing experience and a little bit of bravado, is a pretty amazing solution to this problem. I love that it has a million (well, 7) pockets to separate my bobbins from my sewing machine feet from my pins, that it holds both my scissors and my rotary cutter easily, and that the way it’s designed allowed me to choose a bunch of coordinating colors (and matching zippers!) for one project. I wasn’t paying attention and fused the interfacing to the outside (linen) side pieces, rather than the lining side pieces (pretty foliage). Not sure how much of a difference this ended up making in the final product, as you sew both pieces together right away, but it’s perhaps worth noting. So. Many. Layers. At one point I think I was sewing through three layers of interfacing and eight or nine layers of fabric. My poor, poor, poor sewing machine. I gave up on the idea of attaching the zipper tabs to the bottom binding—there’s no way I could have wrangled the bag into the correct position, and even if I could have, I don’t think my machine could have handled it. I ended up tacking them on with embroidery floss instead, which so far is holding up just fine, but isn’t technically according to instructions. I used invisible zippers instead of regular zippers because I bought the wrong kind and was too embarrassed to exchange them. Everything still works, but I would have liked the look of regular zippers better, and I think they would have laid better (especially the outside zipper, which is curling up on itself). My seam allowances were a bit off for the binding around the top zipper, and I ended up having to make new zipper tabs for the top zipper because the final product was too wide. I’m assuming precision will come with practice, but trying to sew the bag to the zipper and the binding after most of it had been constructed was awkward. Sewing the sides on: even though the bag is made, I’m still not sure exactly how I was supposed to match up the various edges/pockets. It all worked out in the end, but I could have used better guidance (and some photos) from the pattern. Now: on to the good things! So. Many. Pockets! No other bag I found had this many different compartments. I loved the option to embellish the outside (patchworking/quilting, embroidery, etc.). 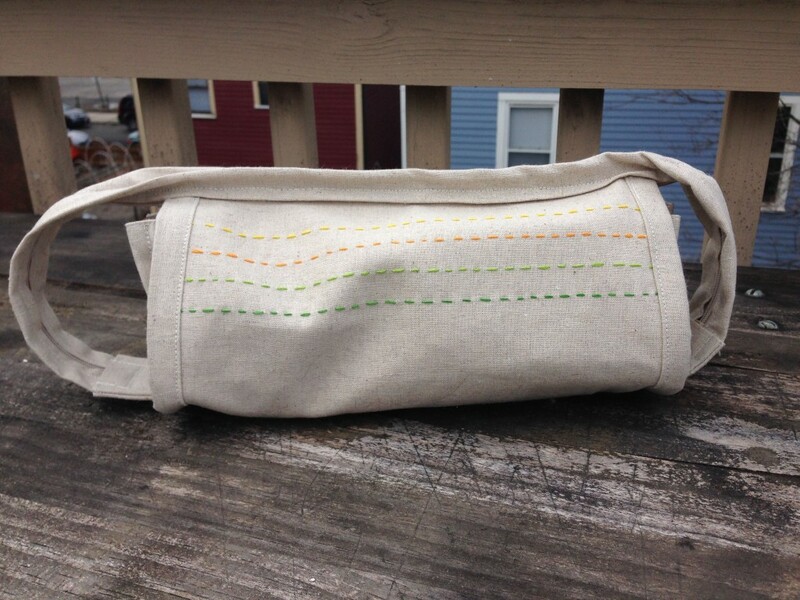 I embroidered four simple straight lines across the front in colors that matched the pocket linings. I really like the way this came out. Yay for surprise colored pocket linings! Double yay that they match the zippers—I love the pop of color when you open up one of the interior pockets. It holds all of my stuff! Mission accomplished. 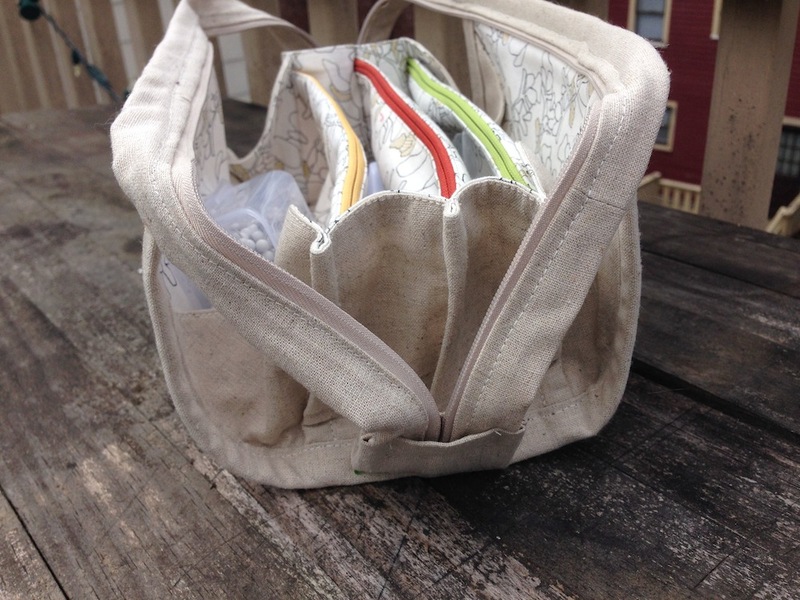 I’m trying to make this bag and can’t figure out what the configuration of the pockets should be when I sew on the sides. No matter how I do it, the center pocket ends up a lot lower than the other two. I think the pattern could use another diagram to show this. I had some trouble with this too, and had to awkwardly squish the bottom edges of all of the pockets against the bottom edge of the side panel—it wasn’t pretty, but it worked. I’ve been thinking about making another one of these—if I do, I’ll try to post better step-by-step images. Good luck!